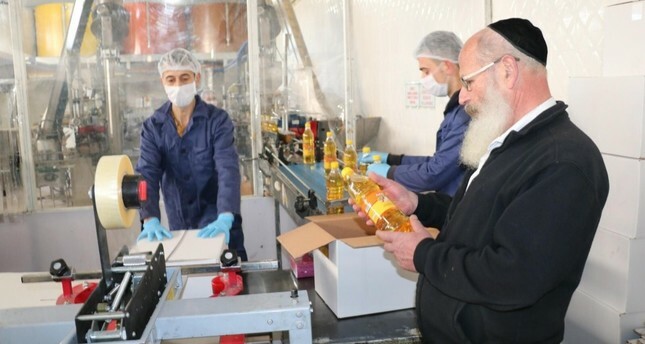 A local firm in Afyon is exporting nut oil to Israel to be consumed during Passover, a Jewish holiday to be celebrated from April 19 to April 27 this year. The Israeli government sent a rabbi to the Turkish company operating in the Aegean province's industrial zone to participate in and examine the production process for the oil. Rabbi Froilich is scheduled to conduct his examinations for two weeks at the factory which is in the process of obtaining the license and stamp required to sell products to the Jewish people. According to Passover traditions, Jews refrain from consuming products with leaven and wheat for seven days. "We have preferred to purchase nut oil from Afyon because their products do not contain any ingredient of leaven," the rabbi said and noted that he is examining the production process on behalf of the Israeli government. "After the production, the nut oils for which Israel granted stamps will be freely consumed in our country," Froilich said. Mehmet Çiftçi, the owner of the business, said that the Israelis pay particular attention to the production environment, which should not include any food product made with wheat, rye, oats or yeast. The firm exports 500 tons of nut oil to Israel and is competing against Ukraine. Çiftçi's firm was reported to be sending 125 tons of nut oil to Israel this month. "We started trading with Israel in 1995. Their main goal in the production process is to ensure there is no leavened product in our business, which is a requirement for their religious beliefs. Each firm sends its own rabbi and initiates the production process," Çiftçi said. Passover is celebrated in the early spring, from the 15th through the 22nd of the Hebrew month of Nissan. It commemorates the emancipation of the Israelites from slavery in ancient Egypt. For many Jews, the process of preparing for Passover involves cleaning every corner of the home and removing all leavened products.